Add the garlic, ginger, coriander and chili to a pestle and mortar or a blender and blend until smooth. Add the tomato paste and canola oil before mixing into the mixture. Add the spices to a pestle and mortar before grinding until fine, you can add rock salt to help break down the spices as you pound and grind them. Add the spices to the aromatic mixture and combine. Cook the Quorn pieces as per the instructions before removing and adding the curry paste. Fry until fragrant before pouring in the coconut milk and combining to marry the flavours. Return the Quorn to the curry and warm through. 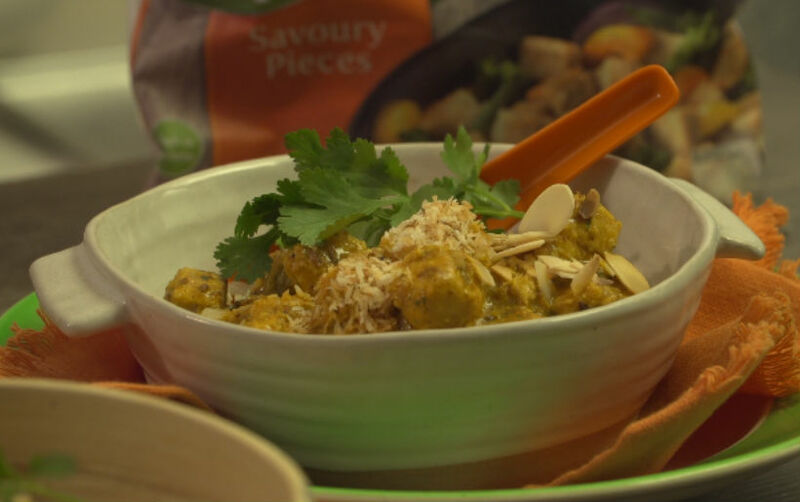 Cook for another 5 minutes before serving with toasted coconut and fresh coriander. Serve with steamed rice.